But how do we encourage people -- especially our kids -- to care more and take action? Social scientists are beginning to look for answers to this question with some promising results. Research indicates that motivating people to care takes more than just reciting facts and making doomsday predictions. Instead, it requires promoting compassionate concern for our natural world, which comes from early contact with nature, empathy for our fellow creatures, and a sense of wonder and fascination. Specifically, scientists are starting to uncover how to encourage that compassionate concern in children, so that it will translate into pro-environmental behavior down the road -- and this research comes not a moment too soon. Painting a disastrous portrait of the earth's future often causes us to simply check out. The idea of destruction on such a massive scale can either be too difficult to contemplate or seem too out of our control to motivate action -- especially action inconvenient to us, like walking to work or bringing our own bags to the grocery store. Psychological biases also play a role. When a problem seems distant or abstract, it can easily be pushed aside by more pressing, immediate concerns, like schoolwork or relationship worries. But scientists have learned that there is a way to overcome these deterrents: developing a compassionate relationship with the natural world. Research suggests that the desire to conserve is intricately tied to our connection to nature--or the degree to which we enjoy spending time in nature, empathize with our fellow creatures, and feel a sense of oneness with nature. That emotional connection increases our sense of personal responsibility toward nature and makes us want to do more to preserve it. For example, one study by Cynthia Frantz and F. Stephan Mayer looked at the relationship between electricity use and emotional connection to nature in dorm residents at Oberlin College. Students filled out the Connectedness to Nature Scale (CNS) and other measures of self-nature connectedness, and scores were aggregated and compared to dorm electricity use. Results showed that dorms with higher average connection to nature scores used less electricity than those with lower scores, and this difference was even more pronounced when students were given direct feedback on their electricity use over time. But dorms whose residents on average scored higher on valuing nature and supporting environmental protection measures did not use less electricity, suggesting that having an emotional connection to nature is uniquely powerful in predicting behavior. 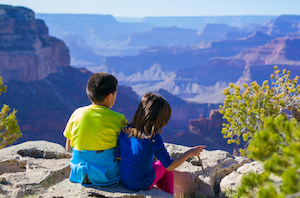 In another study, it was students' implicit feelings about nature that mattered the most. Students from Nanjing University in China took an Implicit Associations Test (IAT), which measured their automatic, unconscious feelings about things associated with built environments (i.e., cars, streets, buildings) versus natural environments (animals, birds, trees). They also filled out the CNS and were asked about their deliberate environmental behaviors--such as how much water they use when washing, or how often they ride a bike or walk to school rather than drive. Afterward, the students were offered a gift of tasty wafers and then asked if they wanted a plastic bag to carry them. Whether or not students asked for the bag was used as a proxy measure of spontaneous environmental behavior. Results from the experiment showed that CNS scores did not predict results on the IAT, suggesting that our conscious feelings about nature may be different from our less conscious feelings. Scores on the IAT were linked to whether or not students took the bag (a spontaneous pro-environmental act), while CNS scores contributed most to explicit pro-environmental behaviors. The researchers concluded, "In the long term, it would be wise to cultivate people's connection with nature, promote the emotional and cognitive tie between humans and the natural world, and increase people's feeling of being one with nature." These studies and others suggest that a caring connection to nature may be an important indicator of how much we are willing to engage in behaviors to save our natural world. And that has implications for our kids. Many kids today are suffering from what Richard Louv calls "nature deficit disorder" because they spend so little time there -- especially kids in cities, where green spaces may be few and far between. Besides having an impact on kids' health and well-being, this lack of contact with nature may also impact their compassionate caring for the environment. Researchers at Cornell University found that, when children before the age of 11 spend time in nature -- hiking, camping, hunting, or fishing, for example -- they grow up into adults who care more about the environment than those who didn't have that early exposure. That caring also translates into more pro-environmental behavior in adulthood, which suggests that getting kids out in nature is important if we want them to become our future environmentalists. Environmental programs in schools are one way to do this. In one study, researchers measured 9-10 year olds and 11-13 year olds on their connection to nature (using the Inclusion of the Self in Nature Scale, or INS), then followed them through a four-day environmental education program focused on water. The program involved lessons about water and immersive, sensory-laden experiences with water, such as walking barefoot through a creek and catching and releasing wildlife in the creek. After the program, the kids were measured again on connection to nature and compared to a group of same-aged kids who hadn't gone through the program. Results showed that the younger children initially had higher INS scores than the older kids, but the education program increased INS in both age groups. In particular, the researchers cited the immersion activities as critical to these effects. However, only the younger kids maintained the increases in INS four weeks later, suggesting that these kinds of programs should perhaps target younger students. Indeed, another study looking at 14-19 year olds showed that participating in a one-day environmental education program on global climate change that did not include immersive experiences in nature had very little impact on connection to nature scores. One possible reason that spending time in nature increases children's connection to it is that the experience feels good in some way. Research on adults has found that spending time in nature helps with what's called attention restoration--helping the brain to recover from sensory and cognitive overload, which reduces stress and improves later performance on cognitive tasks. At least one study with children suggests attention restoration plays a role in their enjoyment of nature, too, and leads to caring more about it. Researchers found that children in schools with schoolyards that had more natural elements reported higher levels of restoration, leading to more positive environmental attitudes. And those increased pro-nature attitudes, in turn, were tied to more pro-environmental behavior. Still, researchers don't know exactly what it is about being in nature that impacts environmental concern and action, though many agree that emotional engagement is critical. So, how can we augment that engagement in our children? Mindfulness may be one potential avenue. At least one study with adults has found a link between mindfulness, connection to nature, and well-being, while another found that mindfulness is associated with "green behavior." Perhaps mindfulness allows people -- and would allow kids -- to pay attention to nature and appreciate it more fully. One recent study randomly assigned undergraduate college students participating in a three-day nature trip to perform meditation (with formal practices in the mornings) or not (a control group). Before and after the trip, students were measured on their connection to nature. Compared to the control group, those who'd been in the meditation group reported greater increases in self-nature connection as well as more spontaneous recollections of trip memories emphasizing nature (rather than other aspects of the trip, such as social interactions). This implies that mindfulness meditation may indeed help increase emotional connection to nature, perhaps by helping people be more present for outdoor experiences or by decreasing their sense of separation from nature. Though research on children is sparse, at least one study found that a program for middle school kids pairing mindfulness meditation and tai chi seemed to increase their connection to nature. Another potential strategy for helping kids care more about nature may be to develop their empathy for animals. In at least one study with adults, instructing people to take the perspective of an animal being harmed by pollution increased environmental concern more than instructing them to be objective. Another study found that anthropomorphizing nature -- assigning human-like qualities to objects in nature -- increased college students' connection to nature, which in turn impacted their willingness to engage in conservation behaviors and promote them to others. Luckily, children naturally seem to identify with animals and nature from a young age. But parents can further encourage their love of animals by introducing them to wildlife in their area, bringing a pet into the home, or reading them stories where animals or natural objects are featured as sympathetic characters. Though engaging kids socially and emotionally with nature may be helpful, we clearly still have more to learn about what makes kids want to protect the environment. Much of the research on this is fairly preliminary, and we are only just starting to understand how to nudge our kids in that direction. Plus, we may need to consider cultural differences more carefully. At least one study found that people from less individualistic/more collectivist cultures are more likely to be influenced by social norms rather than individual concern when it comes to environmental action. This suggests that, in addition to augmenting our kids' connection to nature, we may need to emphasize society's role in influencing behavior, focusing on shared values and community efforts to protect the natural environment--especially for kids from more collectivist cultures. Still, it seems that we would do no harm by simply making sure our kids get outside. Many studies have found that children, like adults, receive psychological and physical benefits from being exposed to nature, including better attention, self-discipline, and cognitive development, and decreased levels of stress. And helping kids to develop more mindfulness or empathy skills wouldn't hurt either, given the research showing their positive impacts on kids. If our kids also end up turning out the lights more or growing up to be environmentalists, all the better -- for our planet and everyone who lives on it.